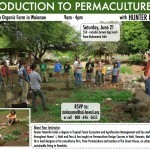 Hunter Heaivilin leads an interactive, ‘Introduction to Permaculture’ workshop that offers a mixture of classroom & hands-on learning at Kahumana Organic Farm & Cafe on this summer solstice 06/21/14. RSVP to [email protected] or call 808-696-2655 for more information. APCRD Director Hunter Heaivilin was invited to speak about his decision to manage all of his personal waste in a more responsible way, and the incredible journeys this decision led to.